Florida is the envy of most other parts of the country due to our mild winters, but even so, you still need to know about winter lawn care in order to keep your lawn healthy and enjoy its lush, green resurgence in the spring. It’s normal for some lawns to turn brown at this time of year, while others will stay green. Read on to learn what you can do for your winter lawn, and remember that maintenance is key to a beautiful lawn- that’s why so many homeowners choose Mr. Tree and Lawn Service as their Gainesville lawn care provider! Don’t do it! While year-round fertilizing is acceptable in South Florida, a winter fertilizing could be bad news for your North Florida lawn. Fertilizer reduces the ability of the grass to resist cold temperatures, making it vulnerable in the case of a cold snap. Do not fertilize your lawn between late September and April to avoid this hazard. 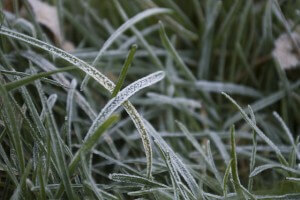 Cold temperatures cause grass to slow down and go dormant. This, coupled with the cooler temperatures and less sun, means that your lawn does not need as much watering. Adjust your sprinkler system to account for this. Your lawn should only require watering every few weeks in the winter. As mentioned above, your grass will grow less in the winter, which means it will not have to be mowed as often. Cutting your grass too much and/or too short can make it more susceptible to freeze damage. Want your lawn to look great all year long? Contact us today for a free estimate on Gainesville lawn maintenance!